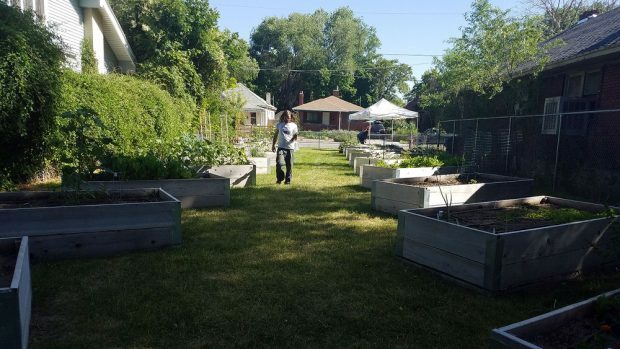 A handful of volunteers toiled away in the name of service for the Social Work Association last Wednesday in the South City Campus community garden. The group was managed by a lady dressed for a Mad Hatter tea party, in a wild blue dress and a big bow in the back of her hair. This “Alice” is Kym Simons, a sociology major at Salt Lake Community College. Simons has been a part of the Social Work Association for a couple of years now, and recently became the president. She says the club is a great way to get out and serve, and meet some unique new people. On this hot June day, the service involved planting vegetables for the Bruin Pantry. The Bruin Pantry is SLCC’s food bank and a great resource for students in need of food. Students can get up to four bags of food a month; all they need is their OneCard. “Food pantries have a hard time getting healthy food, so were trying to provide that,” says volunteer Dave Sanders. The club rented out two plots in the back of the garden and are planting tomatoes, cucumbers, onions, peppers, jalapenos and many more vegetables that they can give to the Bruin Pantry. To do so, however, they need gardeners. 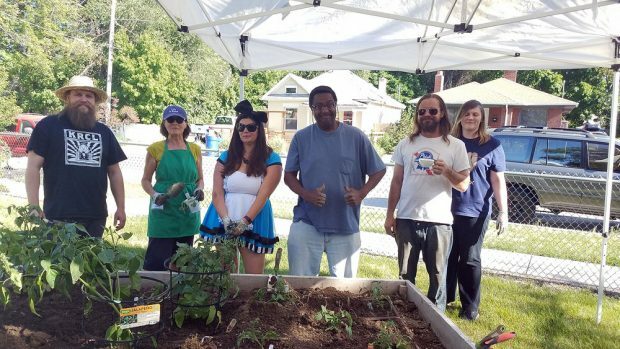 As a former Marine who gardens, Sanders enjoys some personal benefits from this service project. “I need the sun and it keeps me young,” Sanders says. Retiree and volunteer Joelle Drouin knows a thing or two about gardening. “I lived [and gardened] all over the world [since] my husband was in the foreign service,” Drouin says. Drouin needed something to do after her retirement, and that’s what bought her to this 90-degree heat pad in mid-June. Drouin says the key to being a good gardener is the weather. Dan Pool, one of the other volunteer gardeners, has a different theory. The philosophy of the group seems to be that anyone can be a good gardener, and anyone can make a difference in their community. It isn’t about skill or luck, it’s about persistence. Contact the Social Work Association to learn more about the community garden project and other volunteer opportunities.